air joe is proud to serve the Tinley Park community! We are proud to be a part of this community, serving your heating and air conditioning needs: air joe is listed in many directories under titles such as : Tinley Park Heating Contractors, Tinley Park Heating, Tinley Park Air Conditioning, Heating Repair, Air Conditioning Repair, Tinley Park Heating and Cooling Contractors, Rooftop HVAC Repair, Ductless AC Systems, Boiler Repair and Tinley Park Heating and Air Conditioning Contractors. We are here for you whether you need furnace or air conditioner repairs, heating and cooling estimates, equipment replacement or new installation of a furnace, air conditioner, heat pump, rooftop heating and cooling or comfort products to improve the air filtration for your home or business. 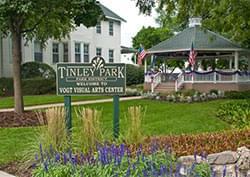 About Tinley Park, IL - Happy to be your hometown Heating & Air Conditioning Contractor! Tinley Park is an Illinois village located in Cook County. As of 2010, its population had exceeded 53,700, and the community has been voted by BusinessWeek as one of the best U.S. cities to raise a family. Tinley Park is known for being one of the fastest growing suburbs located south of Chicago, and recent renovation projects including the South Street Project have revitalized the downtown area. The climate of the Tinley Park region offers four distinct seasons with wet springs, hot and humid summers, and mild autumn months. Tinley Park is home to a variety of attractions that may be of interest to visitors and residents. People who want to take a trail ride can check out Forest View Farms, and families may enjoy a trip to Odyssey Fun World. Golf enthusiasts may enjoy playing a round at the Odyssey Country Club, and the First Midwest Bank Amphitheater is also located in this community. This outdoor venue has seating for up to 28,000 people.